Donna Sharp creates a fun bag for girls on the go with the Pauline. There are little surprises here for Donna Sharp devotees. 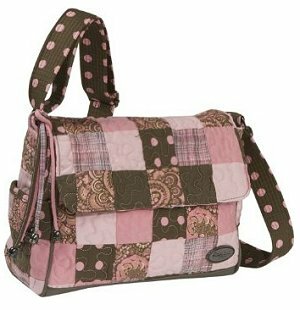 The finish, with its mix of plain, paisley, plaid, and polka-dotted patches, is classic Donna Sharp. All those different patterns could overwhelm, but by sticking with browns and earthy pinks the designer's managed to make it work. The swatches are overlaid with an unusual squiggly quilting, which makes a nice change from the standard diamond stitching! When I first spotted the Pauline I thought it might be a diaper bag. That messenger style, coupled with the soft body, seems made for carrying bottles and other baby essentials. It doesn't have those little extras like gusseted pockets and change pads that we see in bags made for this purpose, but there's all the space new moms could ask for. That space lends itself to many other purposes too. I can imagine it becoming a great school bag for college kids, or an overnighter for short getaways. Whatever you use it for, I'm sure you'll get your $55 worth! The Donna Sharp Pauline bag in Grape Patch, a great alternative to this pink bag.